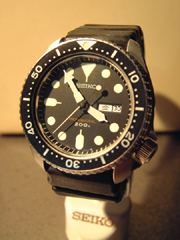 The best-seller professional 200m diver's watch model which attained the performance in 200m saturation diving. The movement is [7C43] which has the same performance as that of [7C46] and smaller size, and magnetic-resistant ability with the high reliability of higher output torque. Although the case structure is a standard type two-piece case (with screw case back) specification, there are 15 new technologies in this case such as; the powerful glass screw ring fixed structure same as 600m with the same glass fixing structure, L shaped glass gasket structure, glass screw ring fixing structure, twin side shield crown structure, special elastic strap made from polyurethane rubber of SEIKO original strap.